The pea leaf weevil can be a challenging pest to manage because there is a high risk of reinvasion of pea crops after spraying with a foliar-applied insecticide. | Photo supplied by Héctor Cárcamo. Southern Alberta is suffering through the worst pea leaf weevil outbreak in its history. “It’s the number one insect concern for growers of peas and fababeans. 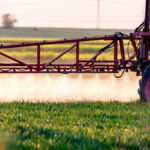 This year we seem to have the worst outbreak that I have seen in the last 10 or 15 years, since they have become an issue,” said Héctor Cárcamo, an insect pest researcher with Agriculture Canada. The pest was abundant in southern Alberta fields last fall, and a mild winter led to high over-winter survival rates. “Last year we had an experiment where we needed to collect weevils by sweeping in alfalfa,” Cárcamo said. This year’s warm and early spring also contributed to the high pest pressure. Adult pea leaf weevils usually overwinter in alfalfa, shelter belts and field margins. 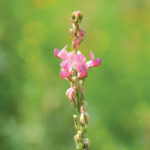 The early spring allowed alfalfa to re-grow quickly, which provided early food for the pest. Weevils then migrate into pea or fababean fields and can attack the emerging crops in high numbers. The larvae, which attack root nodules, usually cause most of the damage to pea and fababean crops, but this year it’s the adults that are causing significant damage. “Because of the high densities of weevils, they are feeding on the plants when they are very small, so they are threatening the establishment of the crop,” Cárcamo said. It’s not common for the pea leaf weevil to kill an entire plant and threaten establishment of the stand. “Plants can typically withstand 50 percent of defoliation,” he said. Seed treatments are the most effective control for pea leaf weevil, but they kill only 30 percent of the adults. However, Cárcamo said the insecticides also affect egg laying behaviour and the larvae, so the cumulative effects do provide crop protection, especially with high insect density. 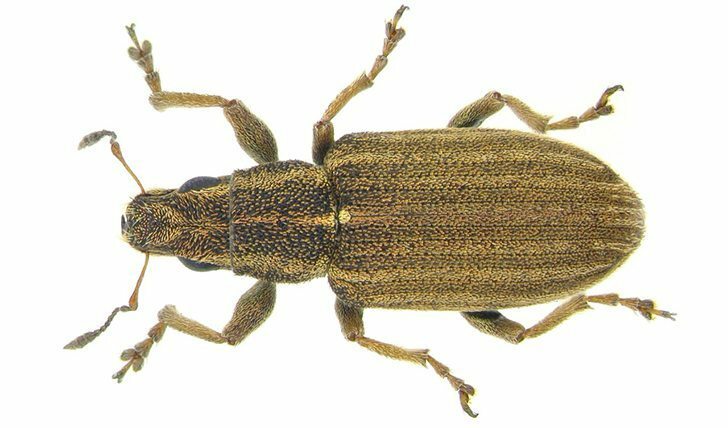 However even seed treated crops have well exceeded the plant damage threshold, and growers in southern Alberta are applying foliar pesticides to control the weevil. “The threshold is three plants out of 10 showing damage on the clam leaf of peas, and I think it’s common to find more than 90 percent of clams with damage in most fields that were planted, early especially,” he said. Growers need to closely monitor their pea and fababean crops after they are sprayed because weevils do not come out of overwintering at the same time and can re-invade crops. 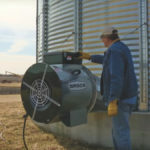 “I also like to remind growers that, when they spray insecticides, they also remove potentially useful predators and other beneficial insects or arthropods from their fields. Repeated and continued use of insecticides is known to result in resurgence of other pests that were kept in check by those beneficial natural enemies,” Carcamo said. He said another alternative is to supplement the crop stand with nitrogen during the seedling stage to prevent yield losses. A nitrogen application can offset the loss of nitrogen-producing nodules in pea and fababean roots, but the economic returns need to be considered, given input prices. Pea leaf weevils are difficult to find because they play dead and fall on the ground when approached. However, if the person who is scouting stays quiet for a minute, the weevils will again start walking around on the plant and become visible. Growers should instead look for damage on the plant leaf when assessing pressure. Look at 10 adjacent seedlings in 10 spots on the field, count what proportion of the seedlings had damage on the clam leaf and then calculate the average damage for the 10 sites. Select five areas on the edge of the field and five spots at least 30 metres into the field. “There is a difference in the level of damage along the border and inside,” Cárcamo said. Field peas should be monitored from the second to fifth node growth stages. Plants are less vulnerable to both larval damage and defoliation after the sixth node stage. 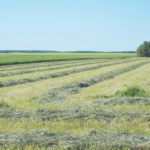 Scott Hartley, Saskatchewan’s pest management specialist, said there have been reports of high levels of pea leaf weevil pressure in southwestern Saskatchewan. “It’s safe to say some areas have had some very high feeding, but we are still getting data on where the highest pressure is,” Hartley said. 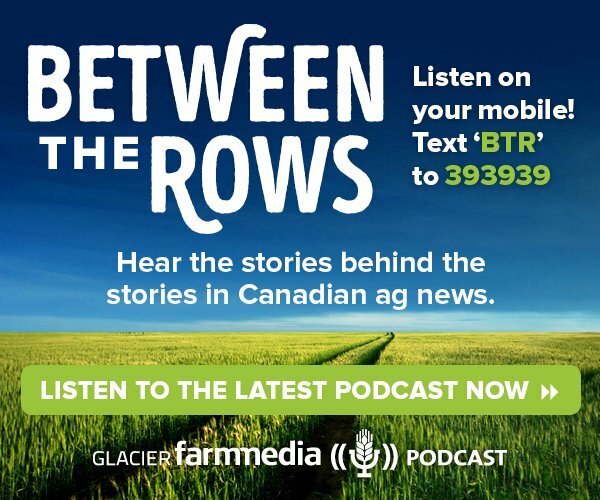 The trouble zone in Saskatchewan starts midway between Moose Jaw and Swift Current and extends west to the Alberta border and as far north as Kindersley and Outlook. Hartley said growers’ level of concern depends on the growth stage of their crop because plants can outgrow damage once they are past the six node stage. Many pea crops in southwestern Saskatchewan are at or approaching this stage, he added.